Whangateau is a unique, unspoilt place located in the Rodney District, 1 hours drive north of central Auckland and less than 1.5 hours from Auckland International Airport. The nearest large town is Warkworth (15 minutes drive), which has a full range of services such a medical centre and supermarket. 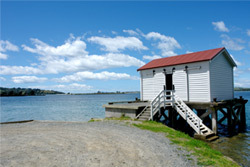 Five minutes north of Whangateau is Leigh – gateway town of the famous Goat Island Marine Reserve. Whangateau Holiday Park is situated on the water’s edge looking across Whangateau Harbour towards Omaha Beach. In the Rodney District you may also like to visit Orewa Top 10 Holiday Park and Martins Bay Holiday Park. For a map and driving directions to Whangateau click here. For more information about things to do in Whangateau and the surrounding region click here.